Keith March, MD, PhD, FACC, serves as Director for the University of Florida (UF) Center for Regenerative Medicine; Vice Chief, Cardiology Research; and Professor in the UF Division of Cardiovascular Medicine and UF Department of Medicine. Dr. March has dedicated his career to bringing new medical approaches to patients. His publications include more than 150 manuscripts. He was the editor of the first book dedicated to cardiovascular gene transfer. Dr. March’s research has resulted in more than 55 worldwide (20+ U.S.) patents, with others pending. He invented the Closer, a widely-utilized patented suture-mediated closure device, used to close the puncture wound in an artery following heart catheterization. This device allows a patient to “walk off the table” after a catheterization without requiring prolonged bed rest. In 1999, Abbott Vascular, an affiliate of Abbott Laboratories, acquired the company that developed this technology; and the Closer approach has been used worldwide to treat more than 8,000,000 patients. He has served as a scientific advisor to numerous pharmaceutical, biotechnology, and medical device companies. His laboratory focuses on blood vessel biology, with a particular emphasis on the function and clinical use of stem cells found in the adipose (fat) tissue, which his laboratory identified as cells with critical roles in blood vessel growth and control of inflammation, importantly mediated by their paracrine factors. Dr. March is recognized as a leading expert in the field of adult stem cell research, particularly that involving adipose-derived stem cells. From 2008-2012, he was Chair of the National Institutes of Health Data and Safety Monitoring Board that oversees cell therapy trials in the areas of heart, lung, and blood diseases. He has participated in numerous cell therapy trials, including those sponsored by the Cardiovascular Cell Therapy Research Network (CCTRN), a group of seven centers in the USA which have conducted NIH-sponsored clinical trials of cell therapies for cardiovascular diseases. He has also obtained FDA approval to conduct U.S. trials employing one’s own adipose-derived stem cells: one to avoid amputations in legs of patients with severe circulatory disease; and another to avert knee replacements in patients with severe arthritis. In Fall 2017, Dr. March was recruited to the University of Florida to spearhead the University of Florida Center for Regenerative Medicine. “The future of health care is to find methods of permitting our bodies to regenerate damaged organs,” said Robert Hromas, M.D., FACP, then-Chair of the UF College of Medicine’s department of medicine. “The Center will emphasize a collaborative spirit across discipline and specialty lines by fostering work without silos. This will allow us to ultimately bring leading-edge therapies from the bench to the bedside.” (http://news.ufl.edu/articles/2018/01/uf-launches-new-center-for-regenerative-medicine.php ). Since his recruitment, Dr. March has worked to identify key unmet medical needs that can be addressed using cell-based therapies at UF, and to develop key clinical trials offering these cutting-edge therapies to patients in need. A key program at the Regenerative Medicine Center involves cell-based therapies to repair and rescue the heart from serious illnesses, including advanced heart failure and untreatable chest pain. 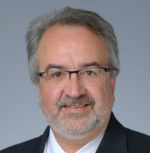 In addition to his research and clinical roles, Dr. March has served in several leadership and board roles, including as the President (2007) of the International Federation of Adipose Therapeutics and Science (IFATS), for which he continues to serve on the Board; and plays advisory roles for organizations related to Regenerative Medicine, including the Foundation for the Accreditation of Cellular Therapies (FACT). In these affiliations, he has worked to advance collaboration as well as public awareness about the significance of adult stem cells.